^ "DGM-E.pdf" (PDF). Retrieved 2010-09-04. Earthenware comprises "most building bricks, nearly all European pottery up to the seventeenth century, most of the wares of Egypt, Persia and the near East; Greek, Roman and Mediterranean, and some of the Chinese; and the fine earthenware which forms the greater part of our tableware today" ("today" being 1962). Pit fired earthenware dates back to as early as 29,000–25,000 BC, and for millennia, only earthenware pottery was made, with stoneware gradually developing some 5,000 years ago, but then apparently disappearing for a few thousand years. Outside East Asia, porcelain was manufactured only from the 18th century AD, and then initially as an expensive luxury. Faience or faïence ( or ; French: [fajɑ̃s]) is the conventional name in English for fine tin-glazed pottery on a buff earthenware body, at least when there is no more usual English name for the type concerned. The invention of a white pottery glaze suitable for painted decoration, by the addition of an oxide of tin to the slip of a lead glaze, was a major advance in the history of pottery. The invention seems to have been made in Iran or the Middle East before the ninth century. A kiln capable of producing temperatures exceeding 1,000 °C (1,830 °F) was required to achieve this result, the result of millennia of refined pottery-making traditions. The term is now used for a wide variety of pottery from several parts of the world, including many types of European painted wares, often produced as cheaper versions of porcelain styles. Medieval Islamic pottery occupied a geographical position between Chinese ceramics, then the unchallenged leaders of Eurasian production, and the pottery of the Byzantine Empire and Europe. For most of the period it can fairly be said to have been between the two in terms of aesthetic achievement and influence as well, borrowing from China and exporting to and influencing Byzantium and Europe. The use of drinking and eating vessels in gold and silver, the ideal in ancient Rome and Persia as well as medieval Christian societies, is prohibited by the Hadiths, with the result that pottery and glass were used for tableware by Muslim elites, as pottery (but less often glass) also was in China, but was much rarer in Europe and Byzantium. In the same way Islamic restrictions greatly discouraged figurative wall-painting, encouraging the architectural use of schemes of decorative and often geometrically-patterned tiles, which are the most distinctive and original speciality of Islamic ceramics. The Muslim world inherited significant pottery industries in Mesopotamia, Persia, Egypt, North Africa (African Red Slip) and later other regions. Indeed, the origin of glazed pottery has been traced to Egypt where it was first introduced during the fourth millennium BCE. However most of these traditions made heavy use of figurative decoration, which was greatly reduced, though not entirely removed, under Islam. Instead Islamic pottery developed geometric and plant-based decoration to a very high level, and made more use of decorative schemes made up of many tiles than any previous culture. The Jōmon period (縄文時代, Jōmon jidai) is the time in Japanese prehistory, traditionally dated between c. 14,000–300 BCE, recently refined to about 1000 BCE, during which Japan was inhabited by a hunter-gatherer culture, which reached a considerable degree of sedentism and cultural complexity. The name "cord-marked" was first applied by the American scholar Edward S. Morse, who discovered sherds of pottery in 1877 and subsequently translated it into Japanese as jōmon. 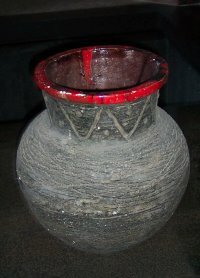 The pottery style characteristic of the first phases of Jōmon culture was decorated by impressing cords into the surface of wet clay and is generally accepted to be among the oldest in East Asia and the world.The Jōmon period was rich in tools and jewellery made from bone, stone, shell and antler; pottery figurines and vessels; and lacquerware. It is often compared to pre-Columbian cultures of the North American Pacific Northwest and especially to the Valdivia culture in Ecuador because in these settings cultural complexity developed within a primarily hunting-gathering context with limited use of horticulture. The densest evidence for the culture is on the middle Danube, the upper and middle Elbe, and the upper and middle Rhine. It represents a major event in the initial spread of agriculture in Europe. The pottery after which it was named consists of simple cups, bowls, vases, and jugs, without handles, but in a later phase with lugs or pierced lugs, bases, and necks.Important sites include Nitra in Slovakia; Bylany in the Czech Republic; Langweiler and Zwenkau in Germany; Brunn am Gebirge in Austria; Elsloo, Sittard, Köln-Lindenthal, Aldenhoven, Flomborn, and Rixheim on the Rhine; Lautereck and Hienheim on the upper Danube; and Rössen and Sonderhausen on the middle Elbe. The Eastern Linear Pottery Culture flourished in eastern Hungary.Middle and late phases are also defined. In the middle phase, the Early Linear Pottery culture intruded upon the Bug-Dniester culture and began to manufacture musical note pottery. In the late phase, the Stroked Pottery culture moved down the Vistula and Elbe. Mogollon culture is an archaeological culture of Native American peoples from Southern New Mexico and Arizona, Northern Sonora and Chihuahua, and Western Texas, a region known as Oasisamerica.The Mogollon culture is one of the major prehistoric Southwestern cultural divisions of the Southwestern United States and Northern Mexico. The culture flourished from the archaic period, c. 200 CE, to either 1450 or 1540 CE, when the Spanish arrived. Porcelain () is a ceramic material made by heating materials, generally including kaolin, in a kiln to temperatures between 1,200 and 1,400 °C (2,200 and 2,600 °F). The toughness, strength, and translucence of porcelain, relative to other types of pottery, arises mainly from vitrification and the formation of the mineral mullite within the body at these high temperatures. Though definitions vary, porcelain can be divided into three main categories: hard-paste, soft-paste and bone china. The category that an object belongs to depends on the composition of the paste used to make the body of the porcelain object and the firing conditions. Porcelain has been described as being "completely vitrified, hard, impermeable (even before glazing), white or artificially coloured, translucent (except when of considerable thickness), and resonant". However, the term "porcelain" lacks a universal definition and has "been applied in an unsystematic fashion to substances of diverse kinds which have only certain surface-qualities in common".Traditionally, East Asia only classifies pottery into low-fired wares (earthenware) and high-fired wares (often translated as porcelain), without the European concept of stoneware, which is high-fired but not generally white or translucent. Terms such as "proto-porcelain", "porcellaneous" or "near-porcelain" may be used in cases where the ceramic body approaches whiteness and translucency. Earlier Greek styles of pottery, called "Aegean" rather than "Ancient Greek", include Minoan pottery, very sophisticated by its final stages, Cycladic pottery, Minyan ware and then Mycenaean pottery in the Bronze Age, followed by the cultural disruption of the Greek Dark Age. As the culture recovered Sub-Mycenaean pottery finally blended into the Protogeometric style, which begins Ancient Greek pottery proper.The rise of vase painting saw increasing decoration. Geometric art in Greek pottery was contiguous with the late Dark Age and early Archaic Greece, which saw the rise of the Orientalizing period. The pottery produced in Archaic and Classical Greece included at first black-figure pottery, yet other styles emerged such as red-figure pottery and the white ground technique. Styles such as West Slope Ware were characteristic of the subsequent Hellenistic period, which saw vase painting's decline. In archaeology, a sherd, or more precisely, potsherd, is commonly a historic or prehistoric fragment of pottery, although the term is occasionally used to refer to fragments of stone and glass vessels, as well.Occasionally, a piece of broken pottery may be referred to as a shard. While the spelling shard is generally reserved for referring to fragments of glass vessels, the term does not exclude pottery fragments. The etymology is connected with the idea of breakage, from Old English sceard, related to Old Norse skarð, "notch", and Middle High German schart, "notch".A sherd or potsherd that has been used by having writing painted or inscribed on it can be more precisely referred to as an ostracon. Josiah Wedgwood and Sons, commonly known as Wedgwood, is a fine china, porcelain, and luxury accessories company founded on 1 May 1759 by English potter and entrepreneur Josiah Wedgwood. In 1987, Wedgwood merged with Waterford Crystal to create Waterford Wedgwood, an Ireland-based luxury brands group. The main assets of Waterford Wedgwood were purchased in 2009 by KPS Capital Partners, a New York-based private equity firm, and the group became known as WWRD Holdings Limited, an abbreviation for "Waterford Wedgwood Royal Doulton". In July 2015, it was acquired by Fiskars Corporation, a Finnish consumer goods company.